In terms of sci-fi books, I think Isaac Asimov is really great. I like the Foundation series, probably one of the all-time best. When asked what books had the biggest impact on him, Ovidiu mentioned The Foundation. Asimov was a masterful fringe thinker, and this first book in the Foundation series shows just how attuned he was to possible and plausible future scenarios. Although it’s 50 years old, Foundation is especially provocative reading given our current state of world affairs — in order to save humankind and the vast knowledge we have accumulated, the main character gathers the smartest thinkers and forms a secret society. But that doesn’t go exactly as planned, either. Red Storm Rising by Tom Clancy also deserves mentioning. Plus Asimov's Foundation trilogy. Then I got into sci-fi and I’ve always sort of loved the space-opera genre probably more than anything else so Isaac Asimov has been huge, I actually only read that in the last 5, 10 years, his entire Foundation series. I went through those from start to finish and they were quite amazing, so easy to read but also big ideas in there. So they were huge in terms of leaving a mark. Start with Sci-Fi at a young age, to cultivate hope and belief in a better and bigger future for humanity. 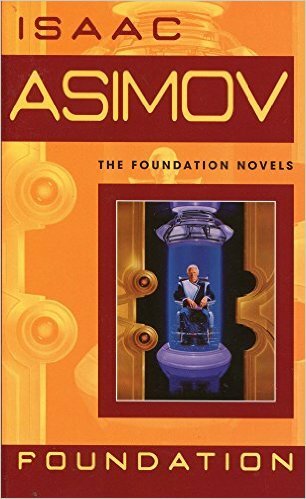 Asimov's Foundation series is a good example. Amazing, complex stories, which trigger a lot of thoughts and new ideas. I think what people miss sometimes is how many similar values and ideas these book series communicate. For twelve thousand years the Galactic Empire has ruled supreme. Now it is dying. But only Hari Sheldon, creator of the revolutionary science of psychohistory, can see into the future--to a dark age of ignorance, barbarism, and warfare that will last thirty thousand years. To preserve knowledge and save mankind, Seldon gathers the best minds in the Empire--both scientists and scholars--and brings them to a bleak planet at the edge of the Galaxy to serve as a beacon of hope for a fututre generations. He calls his sanctuary the Foundation. But soon the fledgling Foundation finds itself at the mercy of corrupt warlords rising in the wake of the receding Empire. Mankind's last best hope is faced with an agonizing choice: submit to the barbarians and be overrun--or fight them and be destroyed.